The First Amendment research papers discuss the right to privacy of all U.S. citizens. Research papers on the First Amendment explores the right to privacy for US Citizens. You can have a research paper written on any part of the First Amendment that you wish. Learn how to write political science research papers on constitutional issues or political science topics. In general, this is a relatively simple proposition, but it does become complicated when rights of one person conflict with the rights of another person. It is my position that even if the rights of privacy of some people are hindered, freedom of speech and the press must be maintained. Freedom of the press, and dissemination of information, is not particularly different from freedom of speech. Both are basic protections of expression. The media do not have any special rights or privileges not afforded to citizens in general. This means that the average citizen has as much right to any document as the news media, and conversely, the news media is the representative of the citizenry of the nation. When public records are withheld from the media, the information is being withheld from the public. The question becomes, what are the exceptions, and who decides what those exceptions will be. Some will argue that a person, or a politician, has a right to privacy. Does the public have a right to know, for instance, if a politician has a drinking problem or some other secret? Autopsies are also a controversial area, where the privacy of the family of a deceased person weighs against the public’s right to know. The families may object to an autopsy being released, but failure to release such information could be used as a precedent for not releasing other documents. It could have a snowball effect, and therefore the records must be open to the public to protect the publics right to all other documents. The Kennedy family managed to suppress results of John F. Kennedy’s autopsy report through a legal loophole. At the time of his assassination, all papers related to the President were the property of the president, and not government property. Because of this, they were not legally public documents until the law was changed in 1981. Mass Media research papers look into the technologies that are used to communicate to a large audience. John F. Kennedy - John F. Kennedy research papers discuss the 35th President of the United States. First 10 Amendments research papers discuss the first ten amendments of the U.S. Constitution, collectively known as the Bill of Rights. 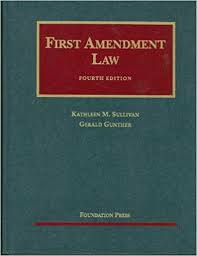 First Amendment Rights During Wartime research papers look at the history of the First Amendment during wartime. Opposition to Dress Code Research Papers delve into first amendment and dress code. Freedom of Religion research papers on the founding father's idea of freedom and religion. Fourth Amendment - Fourth Amendment research papers discuss search and seizure according to the United States Constitution. Freedom of Speech on the Internet - Free Speech on the Internet research papers discuss the concerns, place and purposes of free speech in a democracy. Prayer in School - Prayer in School term papers discuss whether prayer in schools violates the First Amendment of separation between church and state. Fifth Amendment - Fifth Amendment research papers on due process overview Miranda v. Arizona as it applies to the United States Constitution. Funeral Protests - Funeral Protests Research Papers look at the Westboro Baptist Church of Topeka and their mission to disrupt the funerals of American servicemen with shouting, placard waving and hateful speech. Eighth Amendment - Eighth Amendment research papers overview the application of the United States Constitution to the Death Penalty and Capital Punishment. Hate Crimes in the US - Hate crimes are generally defined as violent acts against an individual or group that are motivated by prejudice. Supporting Dress Code - Supporting Dress Code Research Papers discuss why we should have dress codes. Alternatives Exclusionary Rule - Alternatives to the Exclusionary Rule research papers delve into the alternatives that have been proposed to legal scholars regarding the exclusionary rule. Second Amendment - Second Amendment research papers examine the right to bear arms, as determined by the United States Constitution. Contemporary Problems and Moral Theory - Contemporary Problems and Moral Theory research papers discuss a real contemporary problem where the status quo is lined up against something that is in favor of something unjust. Academic Freedom - Academic Freedom research papers discuss one of the foundations of liberal arts education, maintaining that the freedom of inquiry by faculty is essential to academia. Paper Masters writes custom research papers on The First Amendment and discuss the right to privacy of all U.S. citizens.